We’d love your help. Let us know what’s wrong with this preview of Tales from the West by L.T. Suzuki. To ask other readers questions about Tales from the West, please sign up. This review has been hidden because it contains spoilers. To view it, click here. Imago Chronicles Book Two: Tales from the West by L. T. Suzuki continues the story of Nayla Treeborn begun in the first volume, A Warrior’s Tale, which incidentally is optioned for a major motion picture. Tales from the West introduces a palate full of new characters and a new adventure and a new love for Nayla. Will this love be more faithful to her than her first love was? You’ll have to read to see. Tales from the West is artfully crafted with a scintillating storyline and a constant escalatio Imago Chronicles Book Two: Tales from the West by L. T. Suzuki continues the story of Nayla Treeborn begun in the first volume, A Warrior’s Tale, which incidentally is optioned for a major motion picture. Tales from the West introduces a palate full of new characters and a new adventure and a new love for Nayla. Will this love be more faithful to her than her first love was? You’ll have to read to see. There are some books that you simply can’t put down. They grab you emotionally right from the start, and grip your heart so tightly, you find yourself immersed in the story, the characters, the world, you lose all sense around you. This is how it was for me reading A Warriors Tale. Nayla’s journey begins by taking us back to a time in her childhood. At 12, she had to escape the clutches of her abusive Elf father. It’s very hard for me to read abuse in stories, I tend to skim scenes like this, bu There are some books that you simply can’t put down. They grab you emotionally right from the start, and grip your heart so tightly, you find yourself immersed in the story, the characters, the world, you lose all sense around you. This is how it was for me reading A Warriors Tale. Nayla’s journey begins by taking us back to a time in her childhood. At 12, she had to escape the clutches of her abusive Elf father. It’s very hard for me to read abuse in stories, I tend to skim scenes like this, but Nayla is a true fighter. She never backed down even as her father came close to ending her life. I couldn’t pull myself away, I held my breath until she was free, and praised her hero, Joval, for rescuing her. Starting out with so much emotion, I knew I was in for a heartfelt story from the start. The book is the story of how it all began for Nayla, how she became a warrior, and the love, loss, and war she wages along the way. Ms. Suzuki is truly one the most passionate writers I have ever had the privilege of reading. I felt as if I was right beside Nayla as she fell in love for the first time. So many scenes were humorous, and heartfelt, and I wanted Nayla to be happy. I fell in love with her character, and I wanted so badly for her to run off into the sunset, but I understood that the path for Nayla, because of who she is, cannot end as a fairy tale. She is half human, half elf, and receives prejudice from both races. Love is an elusive thing for her. When Joval comes back into her life, she is no longer a 12 year old girl, she has grown to be of the human age closer to 19, and she definitely looks like a woman. They develop a close friendship, partnership, where they depend on each other and take care of one another. I don’t believe I’ve ever read a book that comes so close to a real life relationship as theirs did. And as they fall in love, my heart ached for them to express it to one another. Ahhhh, I can’t reveal too many things, I want to divulge so much, but what I can say is this: I couldn’t go 40 pages without shedding a tear. Naylas journey into becoming a warrior is heart wrenching. I cried tears of joy, tears of loss, and tears and more tears. Ms. Suzuki has a talent like none other, she truly brings her characters to life and the description is beautifully written. Nayla is by far one of the strongest female characters I’ve ever read. Her strength is awe-inspiring, and I will forever have a place in my heart for her. 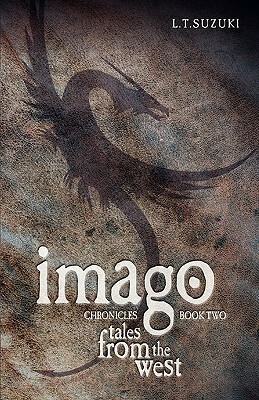 Imago Book One: Tales from the West involves the journey of a group of men known as The Order led by Prince Markus of Carcross. He is accompanied by three noble knights from the surrounding regions of Western Imago - Darius, Faria, and Lando - and Prince Arerys representing the Kingdom of the Elves. An old wizard, Lindras Weatherstone and Prince Markus' young squire Ewan join them as they must first reach Mount Isa to obtain the Stone of Salvation from the Three Sisters - watchers of the past, Imago Book One: Tales from the West involves the journey of a group of men known as The Order led by Prince Markus of Carcross. He is accompanied by three noble knights from the surrounding regions of Western Imago - Darius, Faria, and Lando - and Prince Arerys representing the Kingdom of the Elves. An old wizard, Lindras Weatherstone and Prince Markus' young squire Ewan join them as they must first reach Mount Isa to obtain the Stone of Salvation from the Three Sisters - watchers of the past, present and future who were chosen to guard the precious stone over 1,000 years ago. On their quest beginning on the Western edge of Imago, they will cross the Plains of Fire to Mount Hope where they must unite the Stone of Salvation with the only weapon with enough power to destroy the Dark Lord as he attempts to gain power and rule over all of Imago. Four emissaries of the Dark Lord are in pursuit, leading the soldiers of the Dark Army. The six men must battle against these soldiers, guarding young Ewan for his crucial role in the quest, as they cross the treacherous landscape, gaining an unexpected ally and loosing members of the Order along the way. When all seems lost, soldiers surround them from all sides, they must decide whether or not to accept help from a race of Elves once banished and thought long extinct. From the very beginning of this book, Lorna pulled me in to experience the trials and tribulations of the members of the Order as they journeyed across Imago to Mount Hope in the Iron Mountains to destroy Beyilzon forever. Unlike other novels in the fantasy genre with epic battle scenes, Lorna provides much more emotion in these scenes and includes fighting techniques influenced by her expertise as a 4th Dan practitioner and instructor of Bujinkan Budo Taijutsu. Having read the prequel Imago Book Three: A Warrior's Tale previous to this one, I was a little disappointed to find Nayla not included in the first few chapters, but Lorna did an amazing job foreshadowing her future appearance. She also included other great characters to make up for the lack of the feisty little half-Elf I enjoyed reading about in Book Three. I fell in love with Nayla Treeborn and the world that Lorna Suzuki created in Book One and couldn’t wait to get started on this the second book in the series. It takes place in a different part of the realm and new characters are introduced. I was a little disappointed when I started since it had all the earmarks of being a Lord of the Rings lite. Happily, I was wrong – so very, very wrong. While it does share similarities with Lord of the Rings – epic quest, different groups banding together, wi I fell in love with Nayla Treeborn and the world that Lorna Suzuki created in Book One and couldn’t wait to get started on this the second book in the series. It takes place in a different part of the realm and new characters are introduced. I was a little disappointed when I started since it had all the earmarks of being a Lord of the Rings lite. Happily, I was wrong – so very, very wrong. While it does share similarities with Lord of the Rings – epic quest, different groups banding together, wizards – Ms. Suzuki manages to take what is familiar and put her own unique stamp on a classic theme. I’m not ashamed to admit it, this book made me ugly cry more than once. Nayla’s burden is different in this portion of the tale although not any easier but she continues to carry it with grace and dignity. It is another sweeping tale with love and adventure and heart-breaking sorrow but always the current of hope flows through the narrative. I recommend this book for older, more mature teens, and adults who understand that sometime ugly is necessary in order for beauty to be found. I loved this book! It had me hooked right from the word go. The story expands its horizons from the first book in the series, 'A Warrior's Tale' and Nayla joins a quest to defeat the Dark Lord Beyilzon. Along the way, we get intrigue, betrayal, love and so much more. Nayla has a horrendous experience and once again we see her strength and grit bring her through it. Lorna is a master at characterization and world building. As we venture into the mystical forests of Wyndwood (and beyond) we are intr I loved this book! It had me hooked right from the word go. Lorna is a master at characterization and world building. As we venture into the mystical forests of Wyndwood (and beyond) we are introduced to the fair elves that inhabit this place. With such extended lives, the elves also carry their grievances towards each other that much further. Beautifully written, the story has a multi-layer weave as it carries you along the highs and lows of their expedition. Excellent read and recommended to anyone looking for a story that is more than skin-deep. Lorna has fullfilled the promise made at the end of A Warrior's Tale by giving us vast new lands, new peoples, and new trials.